We have some more postseason accolades for the Federation Champion Hockey Team to share! The Bee Newspapers named their All-Bee Hockey Team, naming 18 players to 3 teams. 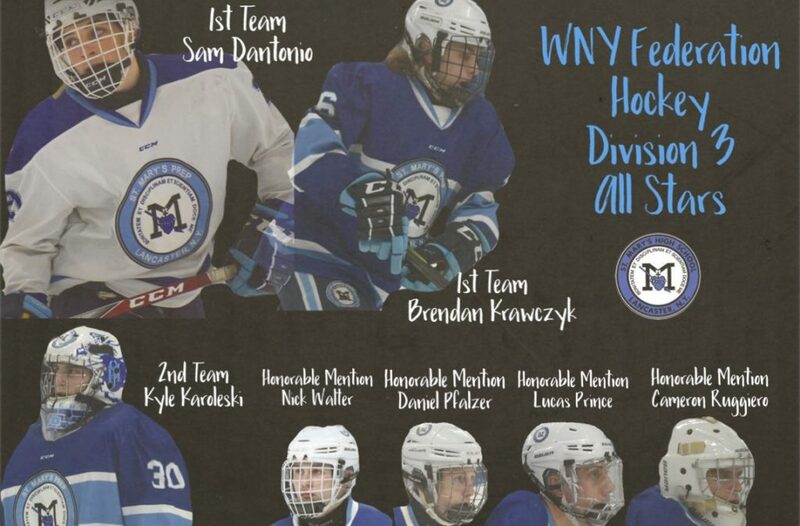 St. Mary's is very well represented, with goalie Kyle Karoleski on the First Team, forward Brendan Krawczyk named to the Second Team, and defenseman Sam Dantonio named to the Honorable Mention Team. Oh, and special shout out to Coach Dantonio on being named the Bee's Coach of the Year in WNY! Well deserved! You can check out the full article from the Bee here. Postseason accolades are starting to roll in for St. Mary's winter sports teams. 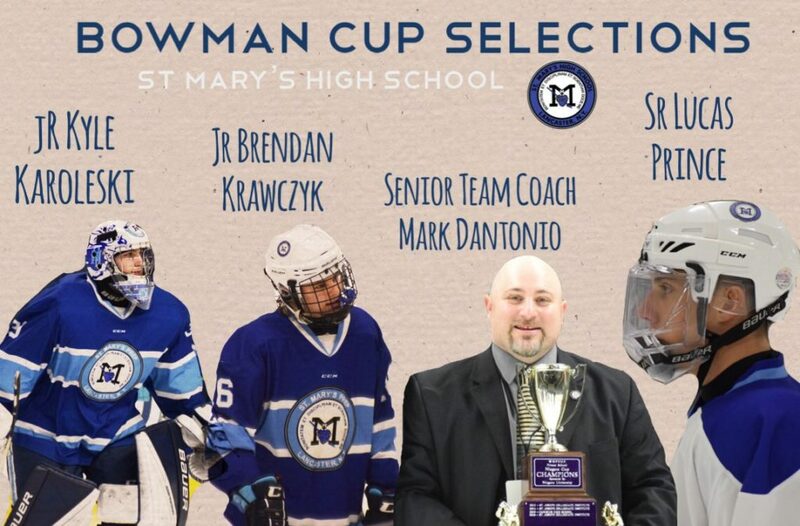 St. Mary's Federation Champion Hockey Team will send three players to the Bowman Cup along with Head Coach, Mark Dantonio. Juniors Kyle Karoleski and Brendan Krawczyk will join senior Lucas Prince on the team. In its first season in the Federation, St. Mary's men's hockey won the whole thing! 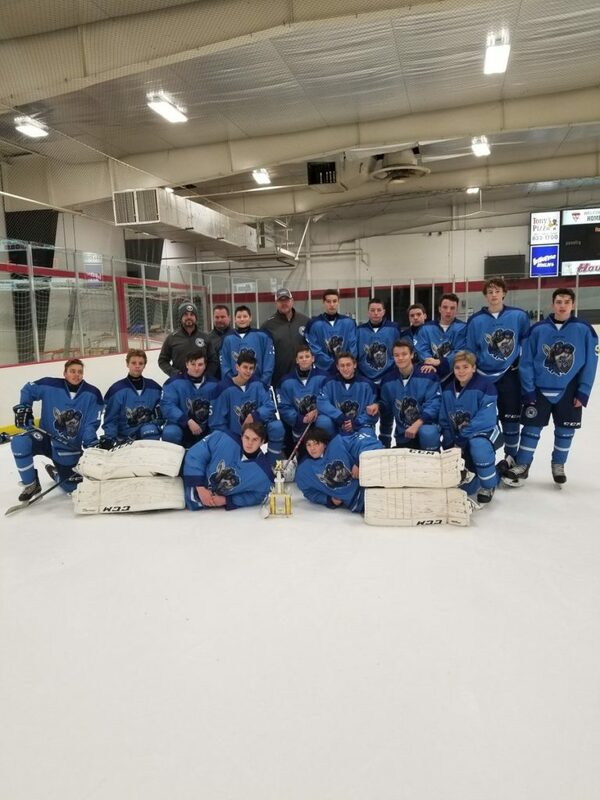 The St. Mary’s Federation Hockey Team brought home the championship against St. Joe’s at the conclusion of the team’s first year in the highly competitive league. St. Mary’s took down all of the powerhouses on their way to the championship, defeating St. Francis, Canisius, and finally St. Joe’s in consecutive games. In the championship, Joe Henry scored with just 95 seconds left, giving St. Mary's a one goal lead and stunning the two-time defending state Catholic champions, St. Joe’s. Henry's tally came seconds after junior goaltender Kyle Karoleski made a sprawling blocker save to deny a 2-on-none break by the Marauders. "It means everything," Lancers coach Mark Dantonio said. "It's almost Hoosiers-esque. These kids are that special and nobody gave them the benefit of the doubt other than the guys in that room." Coach Dantonio has brought this program a long way since the 2014-15 season, building it up quite literally from square one. The Lancers will now face St. Anthony’s (L.I.) for the New York State Catholic High Schools Athletic Association championship on Saturday. Good luck, Lancers! The Lancers shut out No. 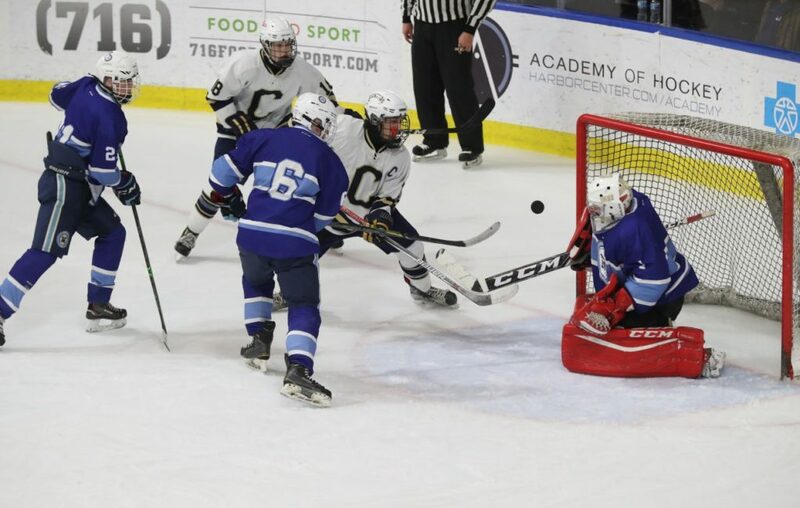 1 seed Canisius 4-0 in the semifinals of the Niagara Cup, earning them a match up against St. Joe's in the championship game on Monday night (2/26) at 8:30 p.m. at Key Bank Center. Daniel Pfalzer scored two goals, while senior goalie Cameron Ruggerio stopped all 36 shots he faced in securing the Lancers' spot in the 8:30 p.m. championship game next Monday at KeyBank Center. "It's a dream come true," said Pfalzer. "First year in the Fed, we're in the finals. We're the underdogs. We're not supposed to be in the final." 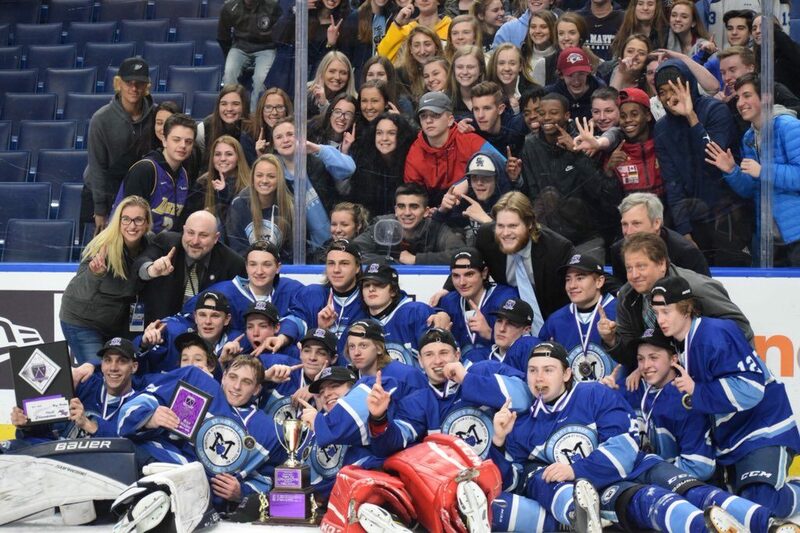 The Lancers, who dropped hockey after the 2014-15 season and returned to the ice as a club team last year – winning a championship at Super Sunday along the way. "That was a great hockey league and that prepared us for here," Lancers coach Mark Dantonio said of St. Mary's brief time in the Western New York Club League. "I told the boys. This is history in the making. Two years ago we didn't even have a hockey team. We sat idle. We got a bunch of kids to come together and believe in what we're preaching." That they are, as the Lancers (16-5-1) capitalized on their chances while denying Canisius (14-7-3) on its opportunities -- getting outshot 36-17. Ruggerio tracked pucks through traffic and simply playing big. The Crusaders held a 15-3 edge in shots after the opening period. The Lancers fired the first two shots of the second period. Brendan Krawcyzk's found the back of the net as he scored off a goal-mouth scramble just 53 seconds into the frame. It stayed that way for a while because of Ruggerio. The 5-foot-8 senior's biggest save came with 7 minutes, 7 seconds left when he denied Cole Beiter's breakaway chance with the rebound chance trickling toward an open net yet somehow staying out long enough for Ruggerio to reach back and freeze it. "I just tried to be quick side to side," Ruggerio said. "After it went off my pad, if my defense wasn't able to get a stick on it, it would've headed straight into the net." "He stood on his toes on that one," Pfalzer said. Twenty seconds later, Pfalzer's wrist shot from the right dot off a rush snuck through the arm and body of the Canisius goalie to make it 2-0. The Lancers made it 3-0 off a 3-on-2 with 5:15 left as Robert Stoklosa received a pass of a give and go from Brent Casillo but instead of skating behind the net, quickly moved to the front and stuffed in a backhand shot. Pfalzer's empty-net goal with 59 seconds left capped the Lancers' first win against Canisius. It prevented the Crusaders (14-7-3) from reaching their fourth straight final. "They believe in each other," Dantonio said. "I can't say enough about our kids." 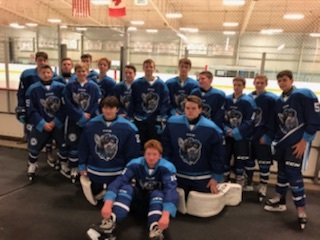 St. Mary's JV Hockey Team had quite the run over the holiday break, finishing second to Grand Island in a holiday tournament. Freshmen Jim Richter and Kyle Young were named to the all-tournament team. St. Mary's took down Potsdam 3-1. Junior Joe Henry had the goal to ice the game in the third. The Lancers also defeated Canton on short rest, 4-1. Junior Mike Chirico had two goals, including the game winner. The Lancers capped off the week with a 4-1 victory over Lewport. Zach Micholas gets the game winner in this one. St. Mary's beat North Tonawanda 4-3 to mark its first fed win. Juniors Daniel Pfalzer, Brendan Krawczyk, Joe Henry, and senior Lucas Prince all tallied goals for the Lancers in the victory. Video courtesy of "Icing the Fed"
St. Mary's beat St. Joe's 3-0 to start the season off on the right foot! Way to go, Lancers!